You’re light on your feet, many of your aches and pains have disappeared, and you’re performing exercises you never thought possible. What Can You Do in Water? Water aerobics activities include tai chi, cycling, weightlifting, ballet, Pilates, Zumba, dance, and yoga to name a few. Buoyancy, the uplift that water provides, will cause you to experience resistance without the jarring impact and strain of dry-land exercises, which can cause or aggravate injuries. Who Benefits From Water Aerobics? The short answer — anyone. More specifically, people recovering from injuries, surgery, or those who have mobility problems that make other forms of exercise difficult or impossible can benefit. 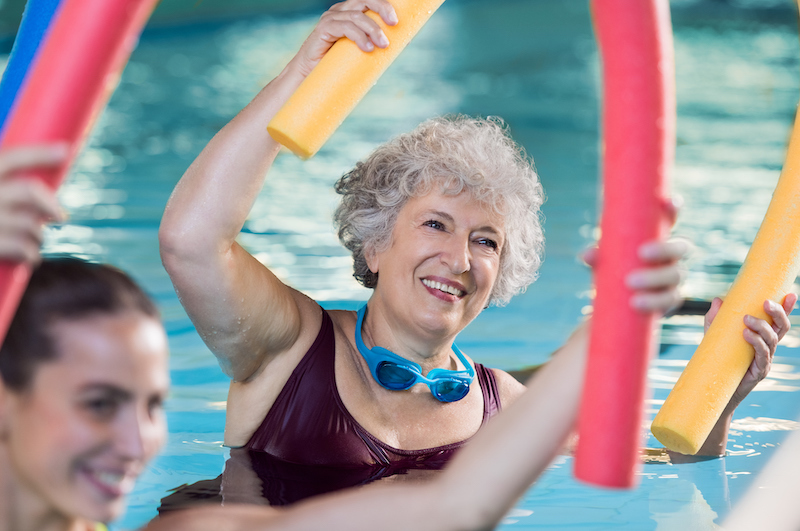 Studies show that senior adults receive significant benefits from water aerobics, including improved cardiovascular health, increased strength, flexibility, agility, improved joint range of motion, and better cholesterol levels. The health benefits also translate to a greater ability to perform daily tasks and a feeling of increased confidence and satisfaction in the independence that improved fitness brings. When evaluating water aerobics classes, look into the instructor’s qualifications. Are they trained to work with people who have health conditions? Are the pool and surrounding areas clean? Have any tripping hazards around the pool been eliminated? Also, make sure ladders and grab bars are secure and the water temperature sufficiently warm. In keeping with well-rounded physical activities for Bethesda residents, water aerobics classes are offered at Bethesda Barclay House in Clayton during the summer months. RehabCare Coordinator Megan Funke teaches the class at Bethesda Barclay House, and she says that residents look forward to it when warmer weather arrives. “It is liberating for seniors because, in addition to being comfortable, water eliminates the concern about falls,” she says. Megan cautions that seniors check with their doctor before starting any new exercise program, and to make sure that someone else is in the pool while you work out. Avoid overexertion, especially if you haven’t exercised for a while, and familiarize yourself with the pool before entering, including the location of ladders and the water depth in different areas. If you are not a good swimmer, or if you are recovering from an injury, start in the shallow end of the pool. Our Independent Retirement Living Communities across the St. Louis area offer a wide range of activities to keep seniors healthy and active. Schedule a tour at a Bethesda community near you to see what is available.